Show & Tell: Kate & Julianna on Working Freelance! Hey, come out this Thursday for the last Show & Tell of the term! 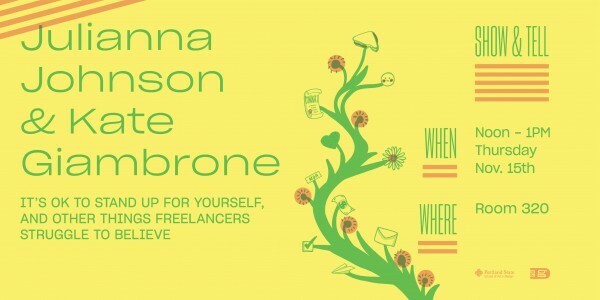 We are excited for a talk and Q+A with Kate Giambrone and Julianna Johnson who will be presenting:It’s OK to stand up for yourself, and other things freelancers struggle to believe. Kate Giambrone and Julianna Johnson make up Portland design studio Bologna Sandwich and are some of the best GD professors here at PSU. November 15th, at noon in AB 320. As always these talks are free, fun, and open to the public!